Fair Winds Press, 9781592337385, 208pp. 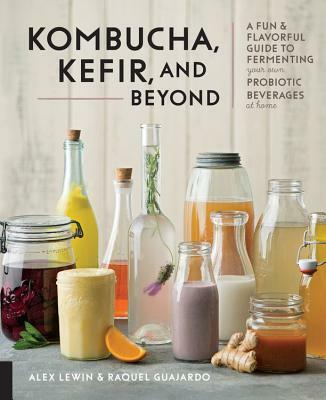 Kombucha, Kefir, and Beyond contains healthy, innovative recipes and instructions to show you how to brew your own delicious, probiotic beverages in your own kitchen. Fermented foods have taken the world by storm due to their health and real food benefits. They help improve digestion, enable us to better assimilate vitamins and minerals, and strengthen the immune system. And of all fermented foods, drinks are some of the most versatile—and tasty! You may be able to buy many fermented trips in stores, but making them at home is simple, economical, and makes them even better for you. With just a few ingredients and materials, you can start brewing your own delicious beverages for your family. Kombucha, Kefir, and Beyond is packed with innovative drink recipes, from healthy homemade sodas to traditional kvass and cider, that you can make in your home kitchen and enjoy all year long! Alex Lewin, a graduate of the Cambridge School of Culinary Arts and the Institute for Integrative Nutrition, seeks to create a healthier and tastier world by spreading the word about fermentation and real food. He teaches fermentation classes and workshops and serves on the board of the Boston Public Market Association, working to create a year-round indoor market selling local food. He lives in Boston and San Francisco. Raquel Guajardo runs a cooking school in Monterrey, Mexico and has a business selling fermented beverages and foods.